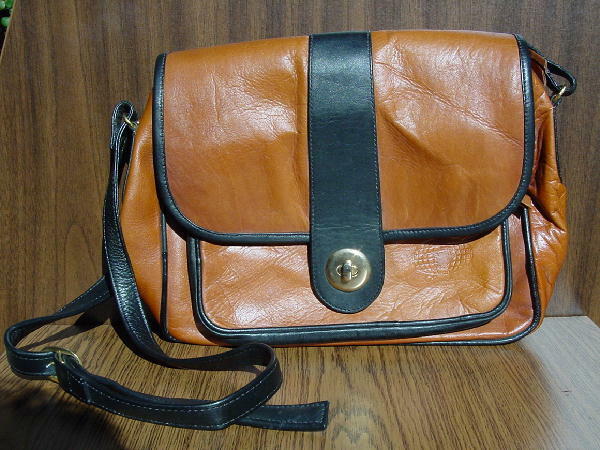 This burnt siena with black trim leather purse has a 46" shoulder strap and was made in Colombia. It has a front zippered compartment and the center section has a top center side to side zipper with an inner zipper pocket. 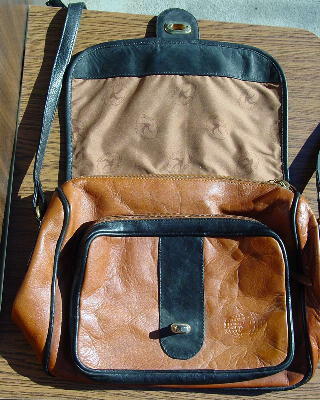 The inner light chocolate fabric lining has ovals all over with Cueritos written outside on top, on the logo in the center, and genuine leather written on the outside bottom. The logo is also on the front compartment. It has a front flap and extended black tab with a gold-tone closure. It's very roomy and was never used. It's from a South American model.